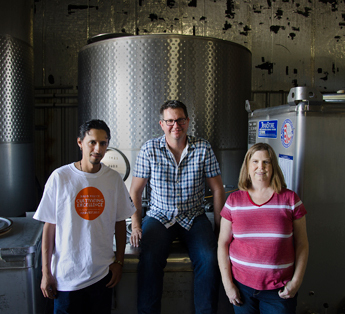 Bruce, Luis and Marcy-the winemaking team. 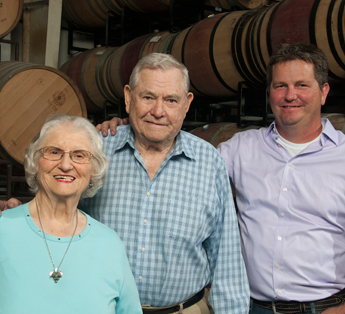 Bruce with Betty & Van in the barrel room. Is it time? Checking the grapes for harvest. 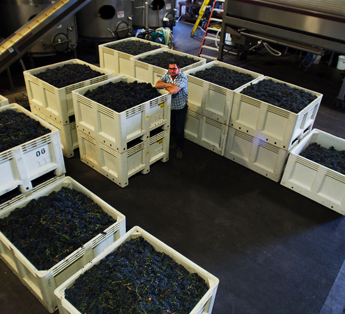 Bruce with the fruits of the harvest in the cellar. Setting up a private tasting. Bruce Devlin started out wanting to be a brew master. 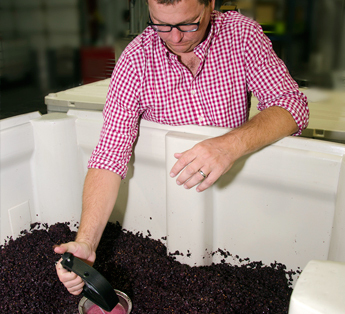 In fact, after a brief foray in forestry at Humboldt State, and an even shorter stint in photography at San Jose State, he ultimately got a degree in Fermentation Science at UC Davis. 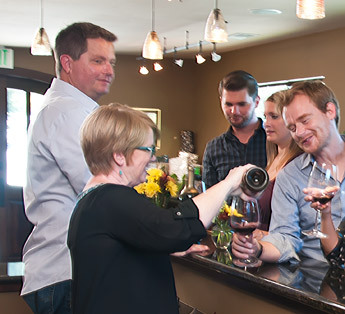 But what started out as an interest in fermentation turned into a passion for science, art and the grape that permeates every exquisite, unique wine Ballentine Vineyards offers. 1994 found Bruce in Germany on a student work exchange program, which included the study of the country. He spent three months working in the Pfalz at Weingut Reichsrat Van Buhl, in the region known for the famous German Rieslings. It was here that he gained his first real appreciation of wine. 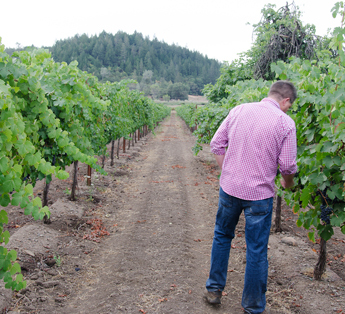 Although Ballentine focuses on Cabernet Sauvignon and other red varietals, he has never forgotten the less-than-humble beginnings of the amazing white Rieslings in Germany. 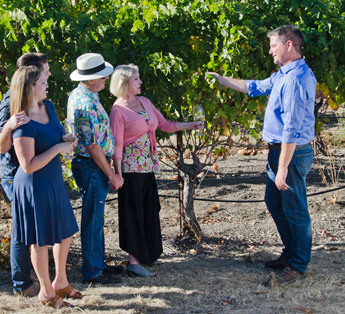 Global wine-making expeditions honed Bruce’s skills in areas well-known for delightful flavors, such as Germany, South Africa and Australia. 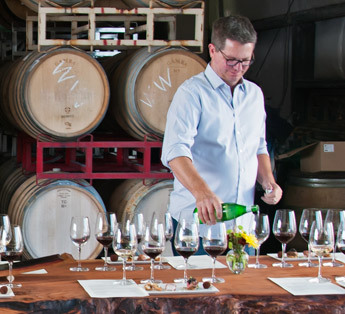 Each destination helped him craft his unique style, found in the numerous high-scoring wines he’s produced over the past 20 years. 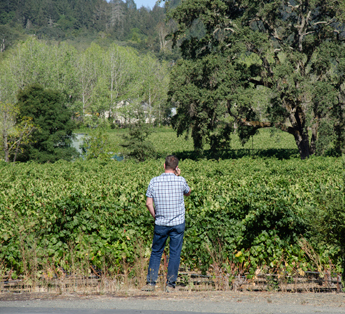 Being the consummate explorer, he never tires of adapting to the yearly challenge of harvesting our estate grown wines, responding creatively to whatever Mother Nature provides. 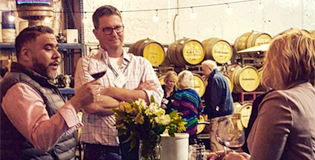 When not making wine or collaboratively managing the vineyards and business with Frank Ballentine, Bruce and his wife are cooking for friends, roaming the ever changing plate of experiences in Napa Valley, kayaking, or skiing the best slopes (wherever in the world they might be).